First, I want to wish all of you a very happy new year. I’m catching up after spending the holidays in England. 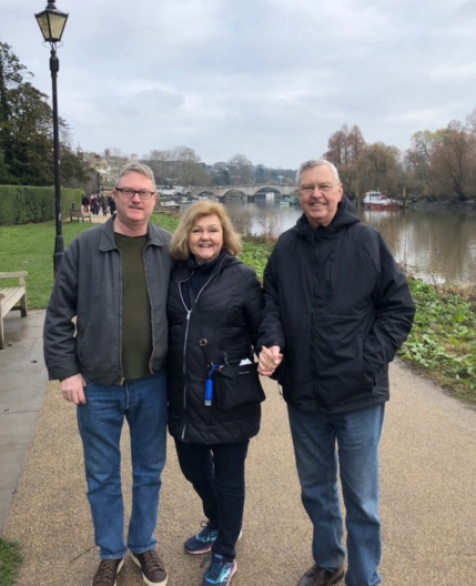 Here’s a photo my oldest son took of his brother, me, and their father walking along the River Thames in Richmond. 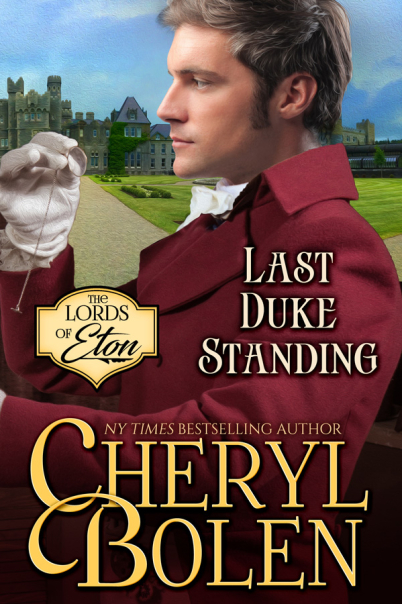 The last book in my Lords of Eton trilogy, Last Duke Standing, releases today, and I’m thrilled over the reviews. Plot summary: After the sudden death of his brother, Alex Haversham becomes the Duke of Fordham and now must break the sad news to his late brother’s fiancée, Lady Georgiana Fenton, who suspects him of murdering his brother. As he and she work together to find the killer, Georgiana fights her growing attraction to the new duke. In conjunction with the release of Last Duke Standing, I’m offering the first book in the Lords of Eton series, The Portrait of Lady Wycliff, for just 99 cents at all eBook retailers, but the sale only lasts for a week. Thanks to loyal readers like you, this book was the number 1 bestselling historical romance book at Amazon. The winner of the sterling anklet, an autographed copy of The Earl, the Vow, and the Plain Jane and a copy of Erica Ridley’s Lord of Chance will be announced Sunday, so hurry over to Rafflecopter to enter. Naomi Haas was my quarterly drawing winner for a $50 Amazon card. More info on all my giveaways can be found here. Remember back in the spring when I was trying to clean out my old copies of British magazines? Well, Ann Parker discovered at the end of the year my email informing me that she was one of names selected in my giveaway a half a year earlier. (I gave away about 25 magazines in all.) She emailed me and asked, “Can I still get my magazine?” So, of course, I mailed a couple of magazines to her last week – after returning from England! One forbidden kiss sets them on a path from which there's no return. In a desperate final attempt to force her cruel betrothed to call off their arranged marriage, Arieen Fleming deliberately creates a public scandal. Aware she'll likely be shunned by Society and remain unmarried, she kisses a dashing swashbuckler at a masked ball. What she doesn't anticipate is her powerful fascination and sensual reaction to Coburn Wallace. And she most certainly doesn't foresee her father casting her out as a result of her madcap scheme. Coburn Wallace is a man who enjoys life and women to the fullest. 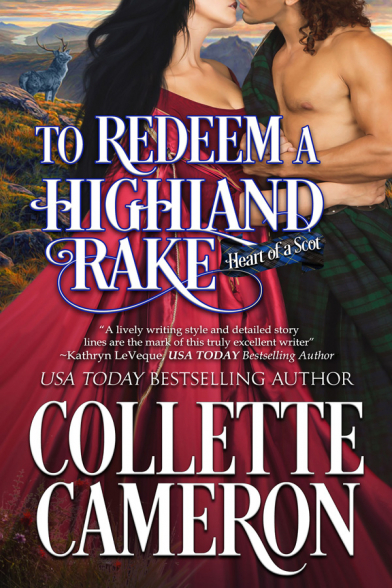 As cousin and second-in-command to a laird, he has no need or desire to marry and produce an heir. When a beautiful female pirate demands he kiss her, who is he to refuse such an unexpected gift? Upon learning Arieen's been disowned and is destitute, he's seized with an inexplicable urge to protect her even as his honor demands he marry Arieen for his unwitting contribution to her ruination. Arieen has no choice but to accept Coburn's offer, and though they can't deny their overwhelming, mutual attraction, dare they hope for more? Can attraction blossom into love in a marriage neither wanted? For an enthralling, emotional Scottish Highland adventure you won't want to put down, read this second book in the Heart of a Scot Series.